This is probably my favourite new MI module. It made me change my mind on random-driven composition. Panel looks intimidating with 4 button, but I’m sure it’ll be easy to understand with practice. Have been eyeballing Chance, but this does look very very tasty. Wow this is really cool, hard to wrap my head around everything. So it has a built in quantizer for the random voltages... the part that is crazy is it says “you play a short jam to program the scale” and it takes the most prominent notes... so cool. Already thinking of how awesome this would pair with rene. Damn, I'm only interested in half of it. All I can say is that this module is a beast. Happy to see that the MI style is now super hands-on but still packed with options. This is one of those modules that will keep on giving. Congratulations on an excellent design. It is packed with functionality! Edit: Dammit you can't embed playlists. Here's (hopefully) a playlist of 5 videos of me tooling around with Marbles. It's a proper mindbender. If you take all the smartest bits of a Turing Machine, SOU, A149, Brainseed, Branches, Grids and a pile of other modules and add buckets of cleverness you're still only halfway towards Marbles. As ever, happy to try to explain anything I've made an arse of explaining in the video. The current piece in my sig (and a bunch more on my BC) have Marbles at their very core if you're looking for some 'in context' use. So it has a built in quantizer for the random voltages... the part that is crazy is it says “you play a short jam to program the scale” and it takes the most prominent notes... so cool. Already thinking of how awesome this would pair with rene. The quantisation might be counterintuitive. AFAIK, it works by playing a sequence of voltages into the module, which are recorded as a "scale". So, e.g., you could record sequence quantised to minor into Marbles. Once the recorded scale is in Marbles, you can quantise external voltages to that scale. But to get the most of it, you need an external way of creating quantised voltages to feed into Marbles in the first place: a keyboard or a sequencer with quantised outputs, e.g. It looks really interesting. I already have a Brainseed, Branches, Grids, and Turing machines (in the form of Ornament and Crime), and a TiNRS Tuesday, which makes me less tempted, but still... .
Did you grab a screenshot of it? Mmmmmmm, bhairav is my favourite scale! 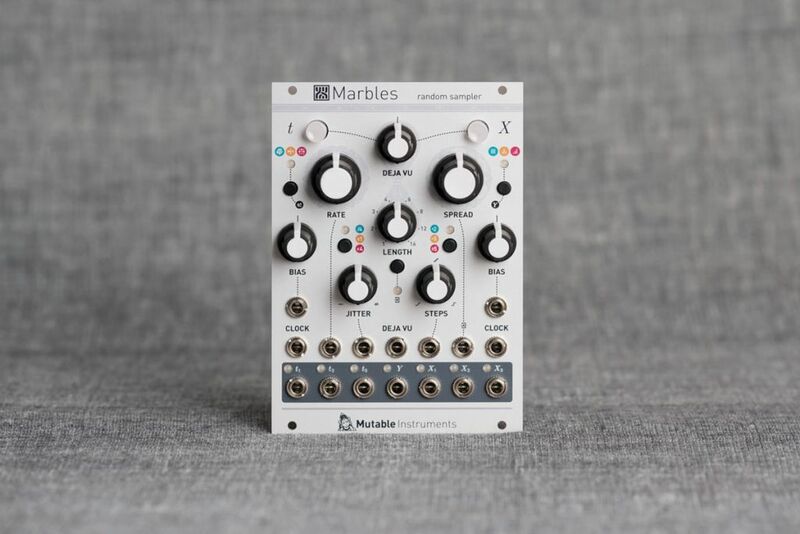 I still think the third new one is my favorite , but I have come to love Marbles like I never expected to. It changed my mind about random too, and gently guided me to different approaches to sequencing. Hopefully my quantisation video helps. It definitely took me a while to get my head around. In a nutshell - you record the voltages you want in your 'scale' (of course these are dependant on your voltage source and could easily be a bunch of non quantized values). The STEPS knob is then used to dial in how those values are output. Fully CCW gives you a smooooooth continusouly fluctuating voltage, at 12 o'clock it's stepped but not quantized to your 'scale' and then as you get progressively more CW it goes from using all your values to stripping it out to its exteremes and just giving you octaves/fifths at it's most CW. It's a complex module but once you start to 'get' it, there is so much reward in there. Fun fact: I had to make the additional video about locking and remixing external voltages a few weeks ago because after months of using this all the time, I'd completely forgotten that in addition to all of the stuff I'd been using it for, that you could use DEJA VU to lock in external sequences and then meddle with them. It was a proper WOAHHHH from me. Contrary to what's happening in the Turing machine, the "loop" doesn't store the actual voltages (or bits describing them), but a kind of "seed" to generate them. What this means is that while the sequence is looping, you can still apply transformations to it - like spreading the notes apart or shifting them up/down. Coupled with the built-in quantizer, it makes it easy to explore harmonically related variations of the same pattern. It's a lot easier in practice than what it looks like, some of the buttons are mostly set-and-forget type, like selecting the range or selecting how the BIAS knob acts. My experience with it is that the way this works becomes second nature really quickly, it's a very playable module! @Paranormal Patroler: wouldn't be too sure about the "half" thing. There's so many uses for this that I wouldn't rule out the second half. After all, you also need modulations don't you? Also you can have it sample CVs' "live" rather than using the random generator, so you can feed it sequences and it'll generate variations of those. Regarding the "half" thing: you reap several benefits by combining the two halves together in one same module. In order to generate nice smooth random lines or curves, you need to know when the next clock tick is going to happen (so that you plan your ramping time in sync with the spacing with pulses). When the X section is internally clocked, the module doesn't have to make any guess as to what is going to happen, because it is already aware of the decisions that are going to be taken on the t side - and you get pretty random curves. Another thing: the module detects some common self-patches; and in this case does the signal routing internally (in software, bypassing the hardware output and input). This eliminates some latency or inaccuracies.